Are you looking for a delicious side dish for a special dinner or your holiday table? How about something just a little different from traditional mashed potatoes? 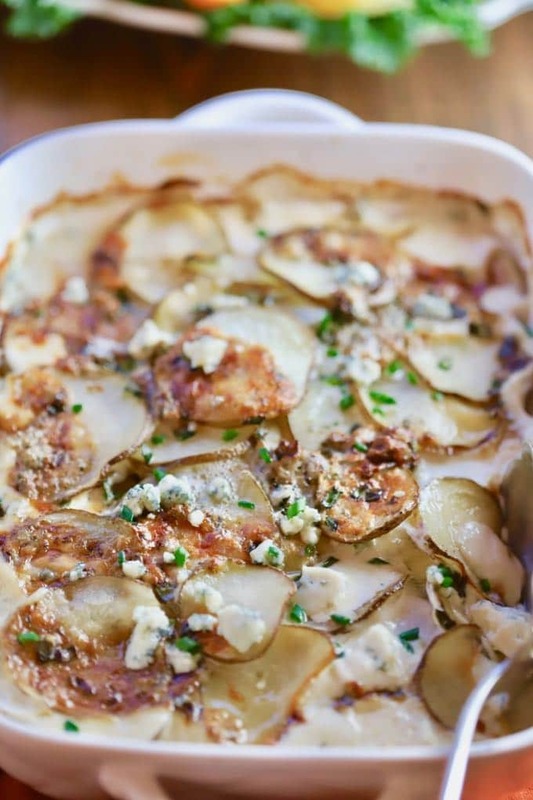 Well, hold on to your chef’s hat because Blue Cheese Potatoes Au Gratin will rock your world. I know what you are thinking, with a name like Blue Cheese Potatoes Au Gratin, this yummy dish has to be hard to make. Well, not really! It can even be our little secret. It only takes a few minutes to put this extraordinary and decadent side dish together. And no one will be the wiser; they will think you slaved all day in the kitchen to turn out this sophisticated and delicious dish! Oh, and did I mention this is one of those dishes that you would expect to eat in a fine restaurant? Blue Cheese Potatoes Au Gratin is all that and more. It’s a 5-star rated dish and one that your family and friends will love! I first had the inspiration for this dish at one of our cookbook club luncheons. We were cooking from My Paris Kitchen, by David Lebovitz. 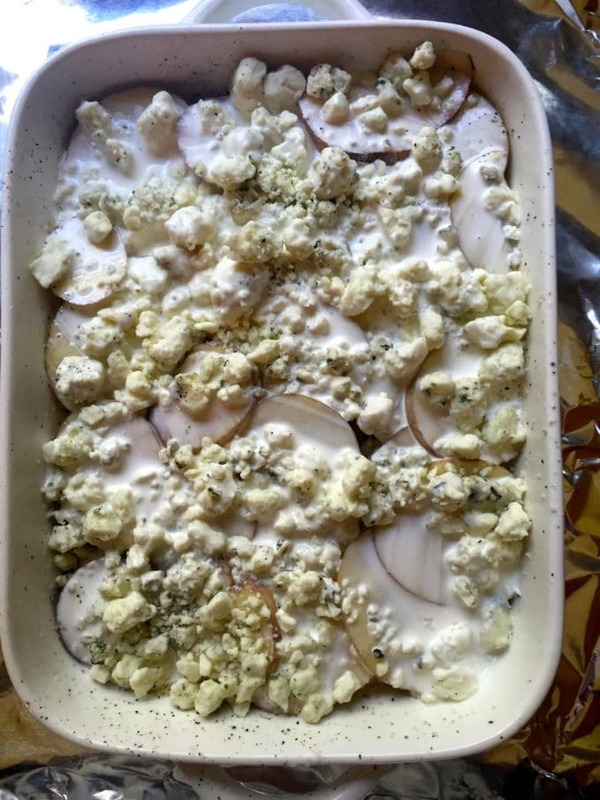 One of our members, Kerry Mohar, made his Scalloped Potatoes with Blue Cheese and Roasted Garlic and we all fell in love with it. Several of us, including me, decided on the spot that this delicious dish deserved a place on our Thanksgiving table. I reworked it a bit to make it a little easier to prepare and think that this version, which skips two steps and takes 50 minutes less time to make, is every bit as good! Need more ideas, just click this link and you can view all of my side dish recipes. 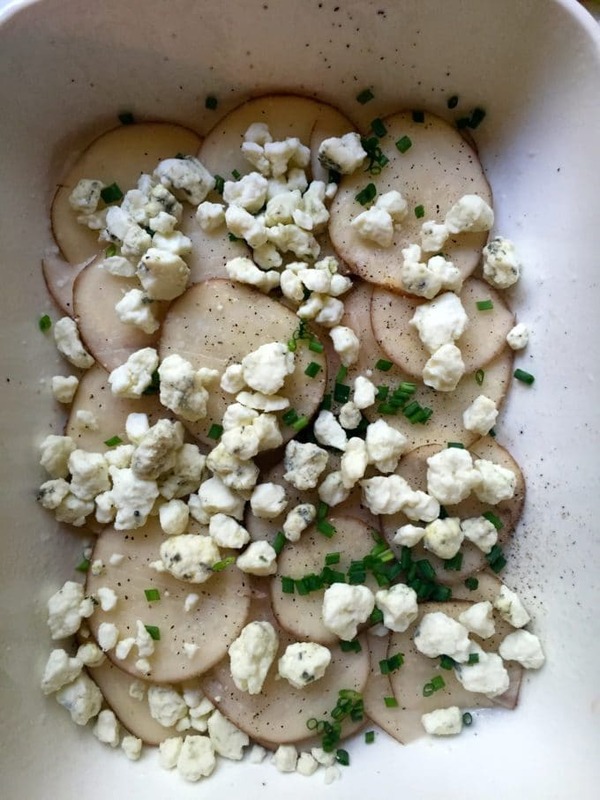 Blue Cheese Potatoes Au Gratin only has a few ingredients which are: potatoes, heavy cream, blue cheese, fresh chives, blue cheese, kosher salt and ground black pepper. If you are feeding a big crowd, just double or triple the recipe. When you are ready to make the potatoes, preheat the oven to 375 degrees F.
Use a mandoline or food processor if you have one, and slice the potatoes about 1/4 inch thick. If you don’t have a mandoline or food processor, just slice the potatoes as thin as you can. You can peel the potatoes if you prefer, but I leave the peel on. Spray a two-quart casserole dish with a non-stick cooking spray or generously butter the dish. Put one-third of the potato slices in the bottom of the casserole dish. Season lightly with kosher salt and pepper. Sprinkle one-third of the chives and one-third of the blue cheese on top. Add another one-third of the potatoes, season lightly with salt and pepper, and top with one-third of the chives and blue cheese. Add the final layer of potatoes, season lightly with salt and pepper and top with the rest of the blue cheese. Pour the cream evenly over the potatoes and press down lightly to flatten the potatoes. Place the casserole dish on a baking sheet lined with aluminum foil or parchment paper and bake for 1-hour, until it’s bubbling and well browned on top. Remove from the oven, top with the final one-third of the chives and serve immediately. 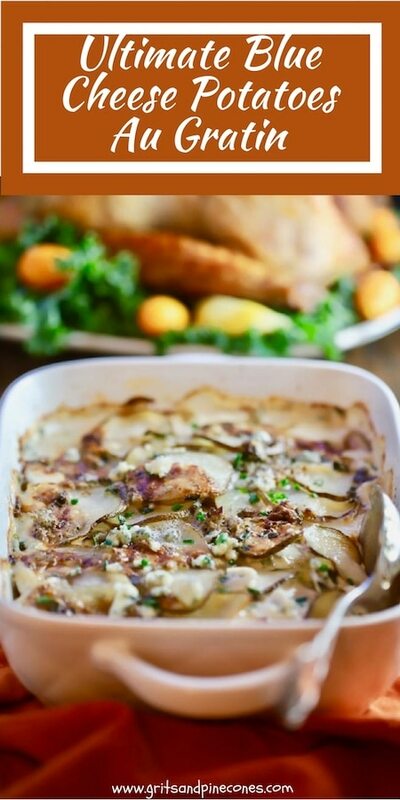 You now have and elegant and delicious Blue Cheese Potatoes Au Gratin side dish. 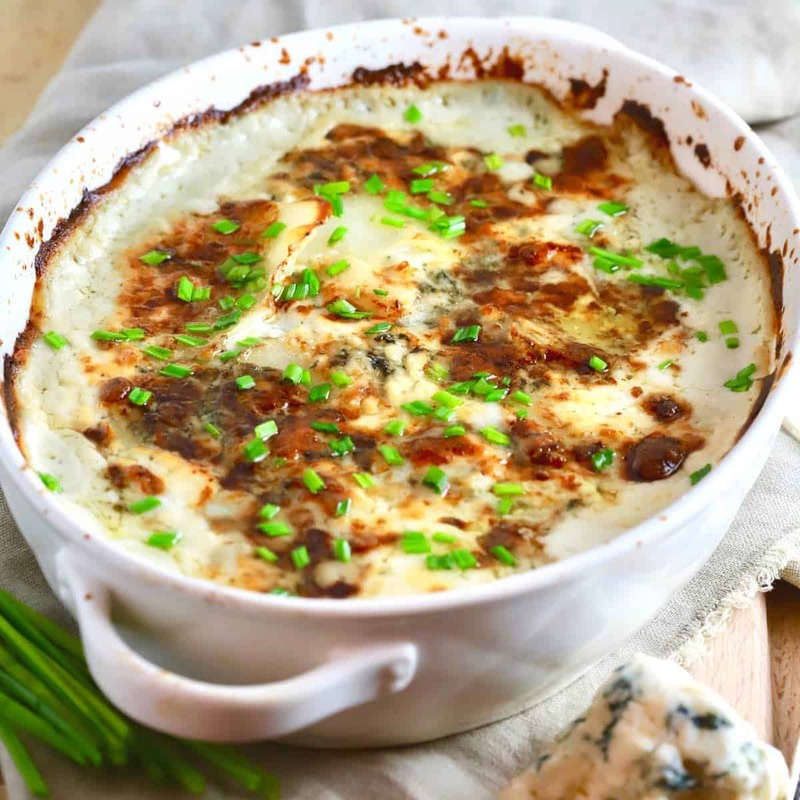 Ultimate Blue Cheese Au Gratin Potatoes are a delicious and easy to prepare side dish for any meal when you want to wow your family and friends. 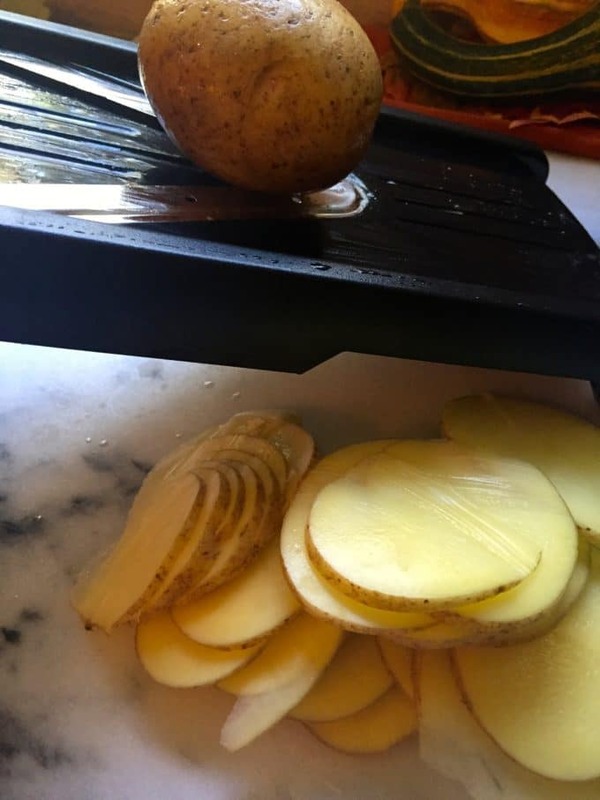 Use a mandoline if you have one, and slice the potatoes about 1/4 inch thick. If you don't have a mandoline, just slice the potatoes as thin as you can. You can peel the potatoes if you prefer, but I leave the peel on. Place the casserole dish on a baking sheet lined with aluminum foil or parchment paper and bake for 1-hour, until its bubbling and well browned on top. Remove from the oven, top with the final one-third of the chives and serve immediately.